A weeping elm features in the brick-paved courtyard behind the Barn gallery and Resident’s gallery. Cast iron gates at Montsalvat’s entrance. 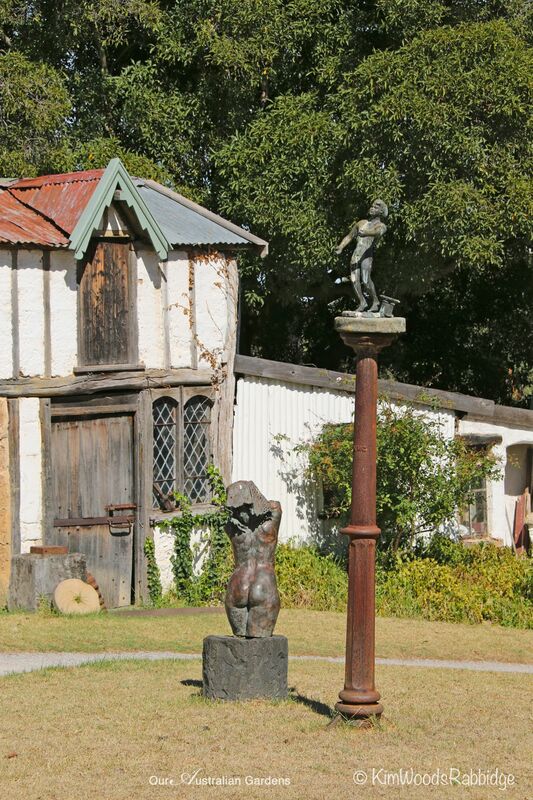 My co-producer Mary Jo Katter had visited Montsalvat, an artists’ colony in Eltham, Victoria, and suggested it would make a lovely blog so I trekked out. It’s just over half an hour from the centre of Melbourne and when I arrived I sensed it was pretty special – perhaps because all the buildings, set in a rambling 4.8 hectare garden, are fascinating, filled with character – a pastiche of past eras. And that’s exactly what Justus Jörgensen, the Melbourne architect and artist planned when he established the property in 1934. The Great Hall where it’s easy to get lost in expansive galleries, corridors and balconies. When he gave up architecture to concentrate on painting one of his main mentors was Max Meldrum, renown for his tonalism. Then in 1924 Jörgensen and his new bride Lillian Smith, a Brisbane medical student, travelled to Italy, Spain, France and England, where they studied old and modern European masters, and painted with Australian friends. Jörgensen exhibited at several major galleries in Paris and London, and his considerable success included having work hung at the prestigious Royal Academy Summer Exhibitions 1926 and 1927. Quaint buildings nestled amongst the gardens are private spaces for practising artists. As you wander around the grounds it’s easy to see the influence of time the Jörgensen’s spent in Europe. Windows inside the Great Hall allow views over the garden. This lovely room is the venue for various events – recitals, weddings, funerals – and everything! Maybe the name Montsalvat is familiar to you? It features in both English and German mythology – it’s the home of the Holy Grail in ‘King Arthur and the Knights of the Round Table’, and it’s also mentioned in Wagner’s operas Parsifal and Lohengrin. Near Luthier’s Cottage – potted citrus are handy for residents to harvest. A thousand vignettes make Montsalvat a photographer’s dream. Eltham’s Montsalvat, classified by the National Trust Victoria, apparently has its own legends, not surprisingly as it’s steeped in culture. It’s believed one of the original residents, painter Sue Vanderkelen, first named it, declaring that Montsalvat meant “mount of salvation”. Gables and oriel windows are some of the charming features. Rooftop detail gives an indication of the nooks and crannies inside. Jörgensen’s dream for an artists’ colony drew a collective of creative and industrious people who constructed the first buildings here, and over the decades others have been added. Figurative bronze sculptures by Matcham Skipper bring life into quiet spaces. Old buildings serve as studios and artists’ residences. Many buildings were made from adobe (mudbrick) and pisé de terre (rammed earth) with soil on site. When a reef of mudstone was uncovered during excavation, Justus expanded his plans and the hall became the iconic ‘Great Hall’. The Long Gallery by the Great Hall hosts several exhibitions each year. Lindy Yeates’ works on paper is delicate, detailed and evocative. Parts of other buildings were ‘repurposed’ from wreckers’ and builders’ yards across Melbourne – probably one of our first recycling communities! Slate from a demolished house, and discarded fire bricks and tiles were utilised; and the demolished Bijou Theatre and Royal Insurance Building proved rich sources for the beautiful cast iron circular staircase, architraves, mouldings, doors and windows. Lovely old buildings in the Montsalvat grounds. A very glam chook house. Guard geese casing the grounds. During World War II Montsalvat became largely self-sufficient, with its own market garden, poultry farm and dairy. For eighty years it’s been the creative hub for all forms and genres of art – painting, drawing, sculpture, photography, film, jewellery, ceramics, glass, textiles, poetry and literature, drama, musical composition, performance and musical instrument making. Resident artist Damien Skipper is the grandson of Mervyn Skipper – one of Montsalvat’s founders, and son of sculptor Matcham Skipper. A Matcham Skipper sculpture outside the original stables. Looking back towards the ornamental pool and courtyard. What’s wonderful is that visitors are welcome in this still vibrant and productive place, where some of the Jörgensen and Skipper descendants, the third generation of original families, still reside and work. Woven willow sculpture by the cottage door. Cottage in the grounds of Montsalvat. Florist and sculptor Wona Bae had a residency early in 2014 when she completed these superb woven willow sculptures. Her work is also in the grounds of Heide Museum of Modern Art and she recently opened her own floral studio Loose Leaf. A wonderful web by florist and Sculptor Wona Bae. Woven burl by Wona Bae. It’s a not-for-profit organisation, a Charitable Trust governed by a board, and supported by many private patrons who wish to support artists, arts education and performance. Passionate volunteers and a dozen or so employees administer and maintain the property. The grounds and buildings are mostly used for exhibitions, performances, conferences, seminars, weddings and receptions while artists such as luthiers, jewellers, painters, sculptors and a writer reside here, and many offer classes. A sign made by Jacki Staude in consultation with Macgregor Knox honours Gwen Forde. The courtyard is the perfect place to meet friends for coffee. A heart made by local ‘yarn bombing’ artists Margaret Summerton and Robina Summers who had a residency at Montsalvat in September 2013. 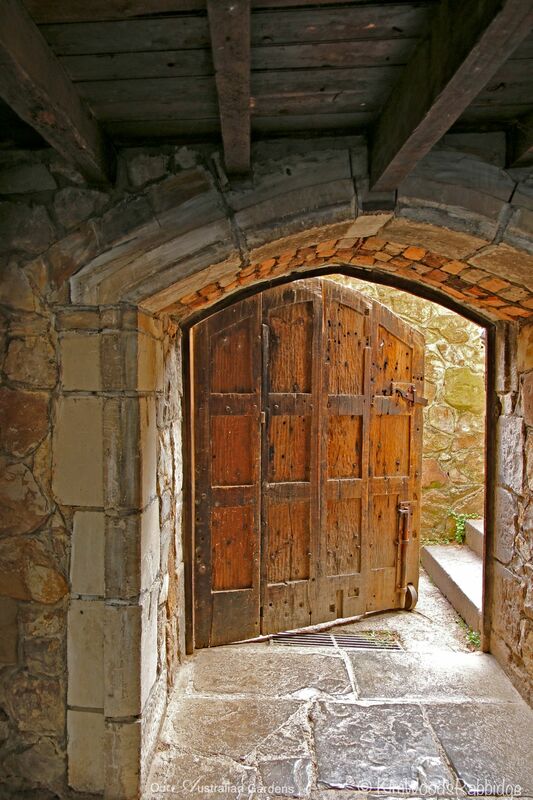 Montsalvat attracts tourists from around the country, and around the world. It’s where both emerging and established artists can work, exhibit, and perform. You can imagine it’s the perfect location for functions, photo shoots and film settings – including the episode of ‘Miss Fisher’s Murder Mysteries’ entitled ‘Murder under the Mistletoe’ which was filmed there. Make sure you visit when next you head to Melbourne! Clay figure by Matcham Skipper. Ah the memories, I used to hang there in the early 1960s, inspiring place! Yeah Man! Flower Power ruled. Montsalvat! How stunning. I didn’t know of this before. Such a beguiling environment for the creation of art. You obviously loved Montsalvat and what beautiful photos you have taken! I am lucky enough to receive your Our Australian Gardens postings and I feel very privileged as I love each and every one! They still have a full program of events Pam – in such an evocative atmosphere. Stone, olive trees, terracotta, iron, ornate windows and doors and some stunning looking buildings. Beautiful. What a wonderful place Kim, photographed beautifully.